Customize your Google Cardboards with stickers, wrapping paper, you name it. You might ask students to submit designs they’ve developed in an art class or simply use a box of craft supplies for inspiration. Companies give them away for free at special events like teacher conferences. 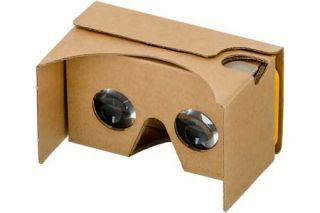 Next time you’re walking through a conference expo hall keep your eyes peeled for free Google Cardboards companies give away as promotional items. Don’t forget to sign up for my newsletter for more tips and special giveaways… including the free eBook 19 Tools for Tech-Savvy Teachers!